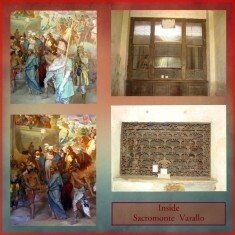 The Italian Scrapbook Layouts below were done using the Heritage Makers Storybooking system. I recently purchased the system after doing much research and testing on several types of digital scrapbooking applications. Here is a link to check out the Heritage Makers system for yourself at my other website for Memory Book Architects. 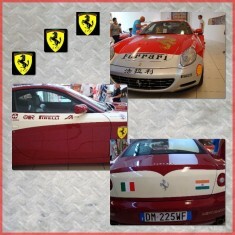 Ferrari Plant in Modena, Italy. 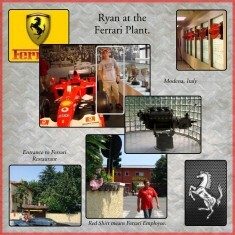 Of course, the Ferrari Plant was a "Must See" for the Trip and I imagine the best for the Guys. 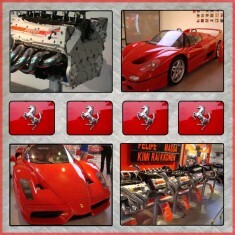 And they took a lot of photos of the beautiful cars and engines. Using the Heritage Makers system, made it easy to download the photos in the system and resize the photos to get more than the usual 3 or 4 onto a 12 x 12 scrapbook layout. 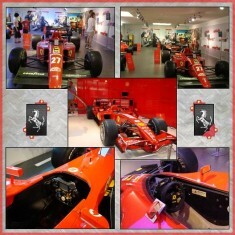 There is even one photo super-imposed over another to highlight the young man in the midst of all those Ferraris. For the left side, I used one photo that had a good image of the Ferrari emblem to focus on just the emblem and cropped it to 2" x 2". Then I duplicated that 3 more times to make a row across the middle of the page. 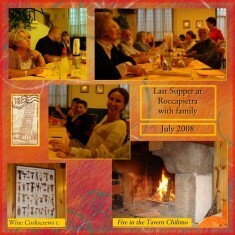 Had I been doing this scrapbook in the traditional format, I would have had to enlarge and print 4 separate photos. 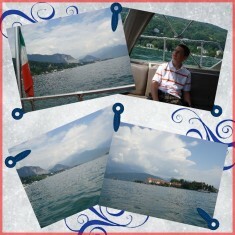 More Digital Layouts below from the Italian Vacation made through the Heritage Makers system. 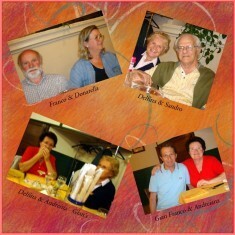 These Italian Scrapbook Layouts show some family photos here of relatives and the last dinner before returning to the United States. The Heritage Makers system used for these layouts allowed me to put photos on an angle, add captions and journaling boxes, resize photos to get more on the page and overlap photos at the corners. 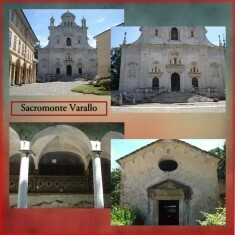 The photos here are of the outside and inside of Sacromonte Varallo and Cappella del Sacromonte. 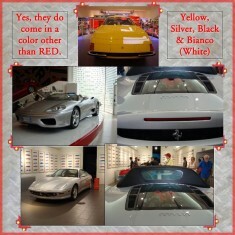 If you look closely at these Italy Scrapbook Layouts, the background "papers" underneath the photos are opposites. I used one background for the left page and turned it upside down for the right page. Another neat feature of the Digital Scrapbooking Heritage Makers system. 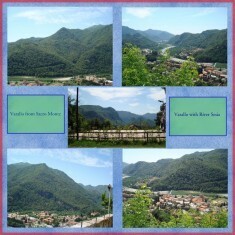 The left layout pictures Varallo from Sacro Monte and Varallo with the River Sesia in the background. 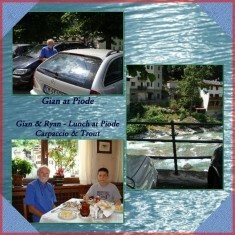 On right layout has photos from Lunch at Piode and the spectacular view from the Resturant at Piode and the River Sesia as it runs through the rocky terraine. 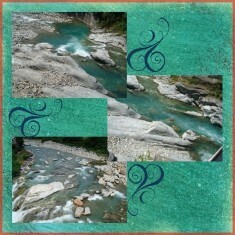 For the layout on the right, I enlarged one photo of the River Water to use for the background of this layout. I also used the background paper from the left side layout and made large "photo corners" for each corner to make the layouts go together. 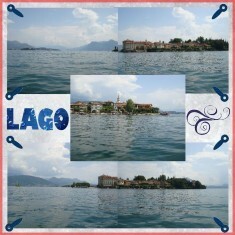 All of the Italian Scrapbook Layouts were done digitally using the Digital Scrapbooking Heritage Makers System. 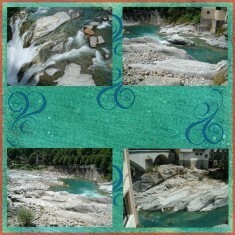 Both of these Italy Scrapbook Layouts show more photos of the River Sesia at Piode. Flourishes were added to these layouts to depict the beautiful swirls in the river. These Flourishes have been turned and positioned at different angles using the Heritage Makers Digital Scrapbooking System. 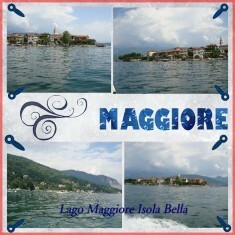 Here are photos from the spectacular Lago Maggiore and the ferry ride to Lago Maggiore Isola Bella. The items learned from the layout on the left is that photos that were taken along the landscape can be positioned to look as though they are 4 x 12 inch panoramic photos. Other embellishments besides the Flourishes and the Photo Turns that have been added and appear to Hold the photos in place. And, I colored them to match the layout without having to get out ink or pens or go to the scrapbook store to make a purchase. All done with Heritage Makers Digital Scrapbooking System. 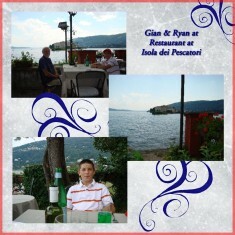 Isola dei pescatori & Restaurant at Isola dei pescatori after the ferry ride and overlooking Lago Maggiore. 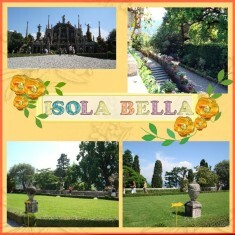 Isola Bella Garden and the Boat Dock and Ferry our two travelers used. 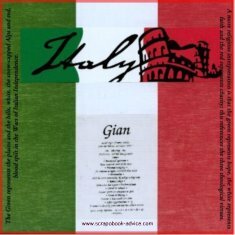 For these Italian Scrapbook Layouts of the Gardens, I used flowers in various sizes, and lettering, each a different color, to add the name of the Gardens. All done with the Heritage Makers System of Digital Scrapbooking. 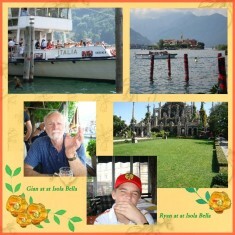 I hope you enjoyed the Italian Vacation Scrapbook Layouts. 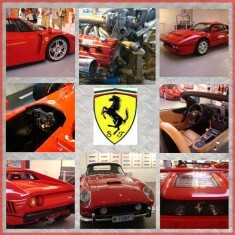 More Layouts of the trip to Italy to come shortly.